Cranberry Cottage is a picturesque waterfront cottage on Cobb Island in southern Maryland. 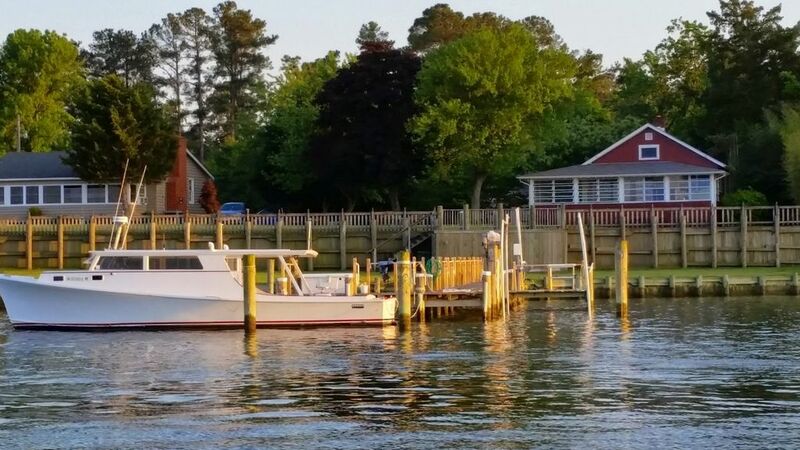 Surrounded by the Potomac River, Wicomico River and Neale Sound, this small island offers visitors the opportunity to experience the peaceful, natural beauty of southern Maryland waterway communities. This charming cottage is recently refreshed and fully furnished with both new and vintage pieces to create a casual coastal vacation atmosphere. In addition to the separate bedroom (queen sized bed) and hall bath, there is a sleep sofa (queen) and pull out chair (twin) that comfortably accommodate additional guests in the spacious open living area that overlooks the water. The quaint eat-in kitchen is fully equipped for easy family dining. The cottage is fully equipped with central air conditioning and ceiling fans. HD digital television and VCR as well as Wifi access are provided for family viewing and convenience. A fully furnished enclosed wrap-around porch overlooking the water allows guests to watch the passing pleasure and work boats while enjoying a cup of coffee at sunrise or an evening dinner at sunset. The 100 foot pier and dock give visitors direct access to the calm tidal water perfect for kayaking, canoeing, fishing and crabbing (bring your own equipment). Traffic is very light on Cobb Island making it perfect for biking, walking and enjoying the native wildlife (osprey, herons, swans and ducks) adding to the serenity of the peaceful waterside. Vintage adult bikes are available in the lower level garage for guest use. Both fishing and crabbing can be done directly from our private pier . A wonderful community playground is just a five minute walk away while a country grocery store, marina, local restaurants, The Cove Coffee & Wine Shop, The Rivah/Ledo's Pizza and Schuttlebutt, are located right on the island. For additional dining and a taste of local seafood try Captain John’s Crab House/Marina and Shymansky’s Restaurant that are located just over the bridge. To satisfy your touring spirit, Cobb Island is within easy driving distances of the museums and monuments of Washington DC, historic Mt. Vernon and Woodlawn Plantations in Virginia, the Civil War Battlefields of Fredericksburg, Virginia and St. Mary's City (early settler's village) in southern Maryland. Sail and motor boaters can make short day trips to various sites within the Potomac River watershed. NOTE: Cranberry Cottage is complemented by Waverly Cottage, a two bedroom rental on the adjoining property (sleeps 4) thereby providing an opportunity to vacation with family and friends in neighboring homes. See our listing for Waverly Cottage Vacation Rentals #7070936. More details on this wonderful feature are available via telephone or e-mail inquiries. "We had a wonderful time at the Cranberry Cottage. Our four weeks here were filled with fishing, crabbing, swimming, great sunrises and sunsets & spectacular views. We enjoyed many a great meals on the enclosed porch. All in all a very relaxing get away! "What a wonderful time we had! Thanks for Great Memorial Day Weekend. "Spectacular!! Thank you very much for a great family weekend. "What a wonderful place to spend our 10th Wedding Anniversary! Full bath with shower and tub. Quiet, beautiful southern Maryland waterways surround this island and waterfront cottage. Terraced lawn leading to private pier/dock. Second refrigerator provided in basement for extra storage. Property owner's personal boats are docked at the Cranberry Pier and are NOT intended for renter use. Local marinas offer small boat rentals and touring cruise opportunities. Quaint cottage with fully equipped kitchen and newly furnished bedroom and comfortable living room. Additional sleeping accommodations on pull out sofa and sleeping chair in living space. Linens and bath towels provided. Ceiling fans and central air condition/ heat pump. TV (HD/Digital Broadcast Television). Wifi accessible Enclosed porch and outdoor dining deck with extensive lawn area. Gas BBQ grill and a private pier that can accommodate boats up to 40 feet. Golf at the renown Swan Point Golf Course just 3 miles down the road.